Lady and Gentlemen, we’ve officially crossed the 3K Milestone in the Store. It was long time coming, as we were expecting this crossover in the past Weekend but it didn’t come. Of this number of course about 60 of this are Desktop Apps. So it is celebration time from Microsoft as those sneering that the Store will not see support from Devs are now put to shame. 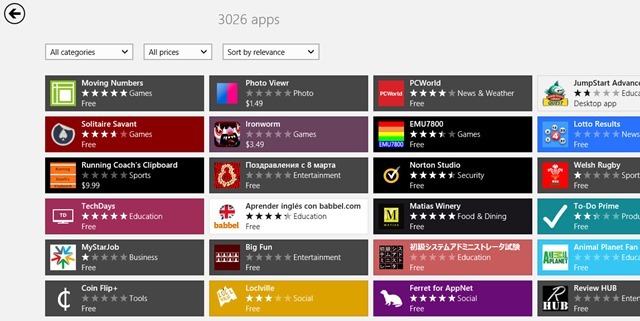 Of course, most of these apps are chaffs, but still there are some quality apps already in the Store, and there are definitely some Apps that Microsoft is holding unto for the GA later this month. So there you have it. Windows Store is no joke anymore, and the best thing is, Microsoft has some surprises for us at GA.
Next Next post: ArcSoft’s ShowBiz App lands in the Store for Movie Making.